Founded in 2007, Ink 4 Cakes specializes in edible products ranging from wafer paper, icing sheets, and edible printers with edible ink cartridges. The company features high quality, FDA-approved filtered edible ink, as well as kosher certified icing sheets and wafer paper. Through shopper surveys, 3dcart customer Ink 4 Cakes identified a major hole in the customer journey from search to sale. Customers who visited the online store struggled with search. The results of keyword search were frequently too broad, resulting in lost sales and an increased burden on the company’s customer support team. While some customers prefer using keyword searches to find what they’re looking for, others can use a guiding hand, especially when confronted with a large number of potential product matches. Ink 4 Cakes founder Drago Kalajdzic saw a clear opportunity to help connect confused customers with the products they needed. Through the 3dcart app store, Ink 4 Cakes discovered FusionBot and integrated a more faceted, advanced search solution into their online store. FusionBot’s Advanced Search app creates a series of filtering options that can help customers narrow down the products they see based on factors like price, category, color, feature, and more. These filters live in the sidebar of the site’s search page and update dynamically as customers choose the filters they want to use. So, if a customer chooses the “Edible Inks” category, the page automatically updates the other filters to only include the available brands, uses, features, colors, and other factors associated with that category. Drago wanted to take this solution to the next level. He got in touch with FusionBot directly. Together, they created a custom “Edible Ink Finder,” a feature on the homepage that makes product filtering fast and simple. 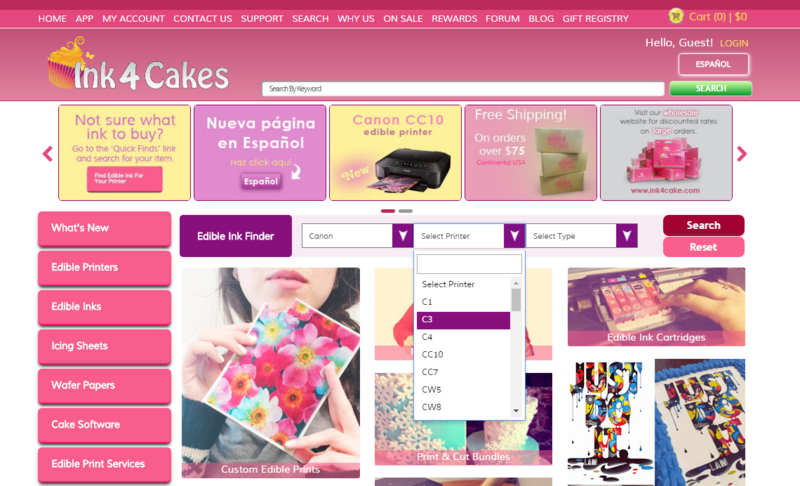 When customers visit Ink4Cakes.com, they’re able to choose the exact brand and model of printer and what kind of ink they’re looking for using dynamic drop-down menus, then clicking “search.” The website loads a search results page based on the filters, and customers can tweak their search using the advanced sidebar functionality if they need to. The product finder helped cut back on unfruitful searches that relied too heavily on customers to find the exact wording for the search. In the first month alone, Ink 4 Cakes realized sweet results, including an 8% jump in conversions and a 30% drop in customer support calls. Because FusionBot is tightly integrated with 3dcart, Drago can control the search experience from the backend of the ecommerce platform. It all runs together seamlessly, creating a central management experience that helps small business owners keep a tight, organized shop. To learn more about how FusionBot and 3dcart work together, visit the 3dcart app store.